This applies to Eudora OSE only. Earlier versions do not have support for chained certificates and so can not take advantage of SSL/TLS. 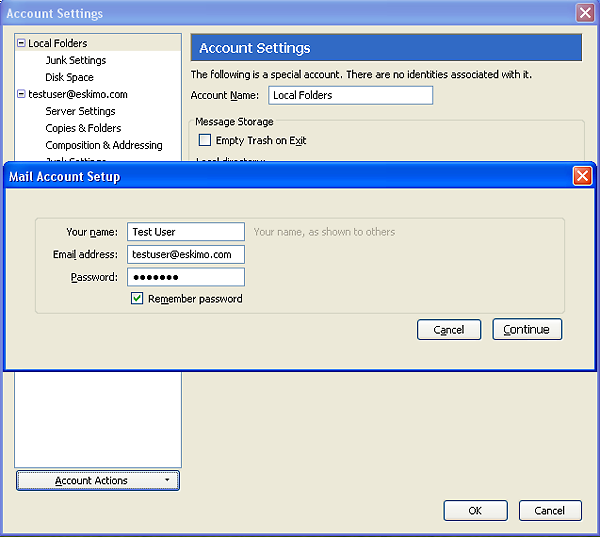 In the Tools pull-down menu, select Account Settings. Near the bottom of the left paine there is a small pull-down menu labelled Account Actions. 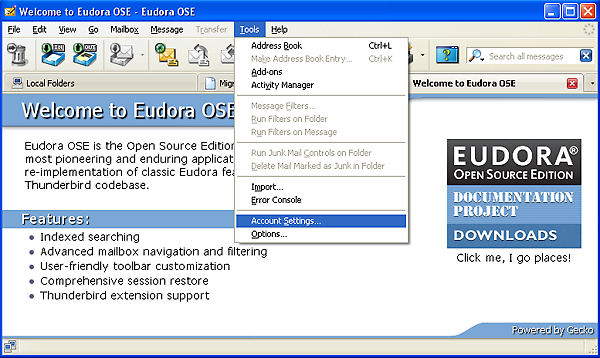 Select Add Mail Account from this pull-down menu. 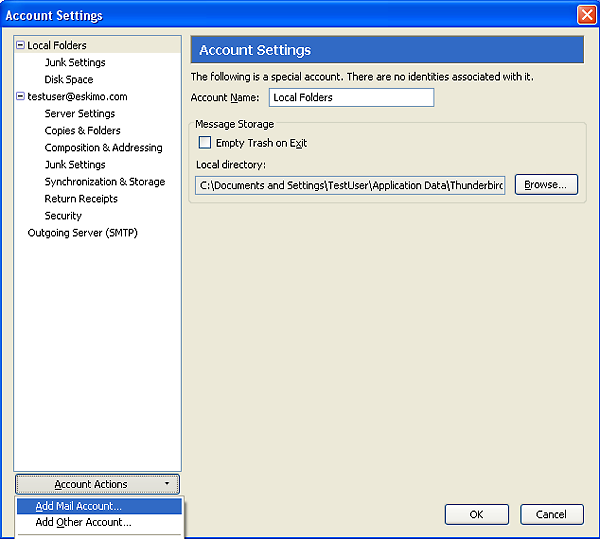 In the Mail Account Setup window that pops up, fill in your name, e-mail address, and password. If your computer is private and secure, then I also suggest that you check the Save Password box below. If you do not check Save Password, then you will be prompted for your password each time you send and retrieve e-mail. 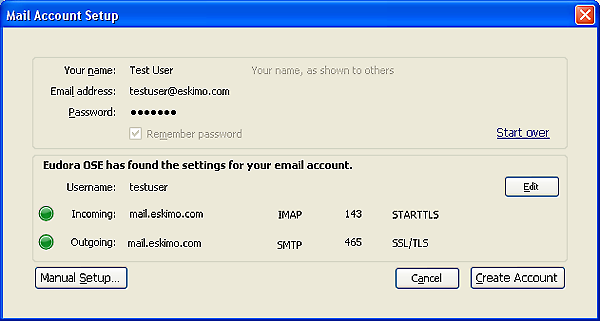 After you fill these in, press the Continue button.If you are using an eskimo.net address, put your address in as eskimo.com so that the auto-configure will find the correct servers, then change it after auto-configuration has completed. 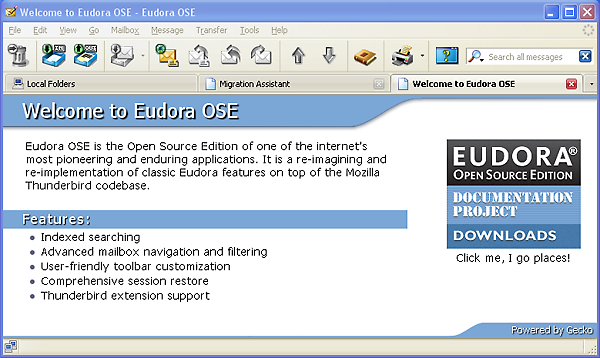 At this point Eudora has found the server and ports and selected working settings. These settings will result in a fully encrypted e-mail session. At this point you can push the Create Account button and you are done! You can make your mail session authenticate just a fraction of a second faster by selecting Manual Configure and then changing the incoming port to 993 and the encryption to SSL/TLS, however it will function just fine as is.